The Warriors was first produced as a novel, written by Sol Yurick in 1965. In 1979 it was made into a film. A video game many years later in 2005 and an online pokie in 2014. iSoftBet has released a Warriors online pokie: Can You Dig It? 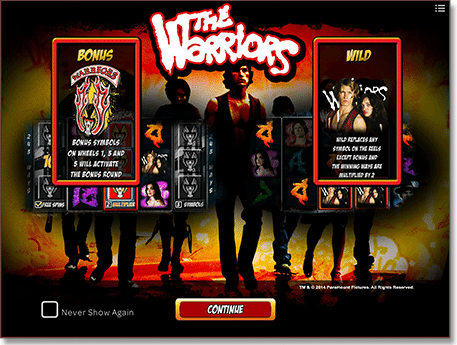 The Warriors is a five reel, 243 ways pokie that can be played for fun or real money at our promoted casino, SlotsMillion.com. Coin sizes range from 0.1 to 1 and you can play a maximum of 5 coins per line or 25 coins per spin. In keeping with the movie the background track plays the distant sound of the subway in motion. It was a bit disappointing that there wasn’t any late 70’s/early 80’s synthesized rock playing, but you can’t win them all. The graphics, like all iBetSoft games, are crystal clear and right on the money. The “Spin” button is the nozzle of a spray paint can, an homage to the “Rembrandt” character: the Warriors chief graffiti artist. The symbols in The Warriors are unique because all the symbols that aren’t characters from the film are represented in graffiti style. In ascending order of value the symbols are 10, Jack, Queen, King, Ace, Cochise, Cowboy, Swan and Mercy. The symbol featuring both Swan and Mercy with the Warriors graffiti behind them is the Wild symbol and substitutes for all symbols except the scatter Warriors insignia symbol. The Warriors insignia is the scattered feature trigger. The feature game is triggered when The Warriors insignia symbol appears anywhere on reels one, three and five. Once triggered reels one, three and five become solid with each reel now comprising of three covered symbols to choose from. Each of the reels now represents one aspect of the feature game you are about receive. The first reel has three options representing how many free spins you will get, as many as 50. The second reel has three options representing the multiplier you will have during your free spins: as much as x5. The third reel has three options representing which symbols will be stacked during your free spins: low paying symbols, medium paying symbols or high paying symbols. You get to choose one symbol from each reel. Once you have uncovered how many free games, at what multiplier with which symbols are stacked, the free games begin. iSoftBet has made a great reputation for themselves creating original games but mastering the recreation of movies for the online pokie market. The Warriors is a great game and with the possibility of 50 free games x5 with high paying symbols stacked during the free games some big wins are on the cards. The lack of a bonus game to match the feature is a little disappointing but not a deal breaker by any stretch of the imagination. Sign up to SlotsMillions.com and take advantage of their double deposit bonus to start playing The Warriors for real money.